Daria Morgan is a magic practitioner, one of a group of people who uses magic and spells to do their everyday jobs. Her job: A management consultant. John “Bent” Benthausen is a CEO who, despite every improvement in product and production, can’t get his bottom line out of the Red Sea. He needs a management consultant. With her special gifts, Daria gets right to the heart of her employer’s problem—crooked employees. Crooked, vicious, employees who are now out to get Daria. Those are just Problems One and Two. Problem Three: There is an ancient force, an irresistible compulsion, called the soulmate imperative. It’s known throughout the practitioner ranks for bringing together magic-users and their mates in a lifelong bond. And it won’t be happy until the participants surrender to the inevitable . 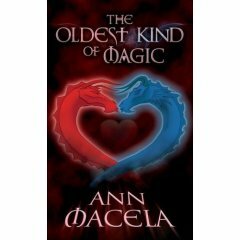 . . the Oldest Kind of Magic . . . I certainly do hope Ann plans on bringing out more books about the Morgan Family. Even a continuation of Daria and Bent. I just absolutely loved these characters and I want more DAMNIT!!!! LOL. I wasnt sure at first if I was going to like this book or not. Had I not gotten this book in the mail (I can't say anything more on that) I probably wouldnt have picked it up. Now I have a new author to look forward to. Bev, it's in print. Medallion Press is a smaller pub, but you can find them in Waldenbooks or Barnes and Noble. Or order it. I've had this on my tbr shelf for awhile, need to read it sometime. OH! I've been wanting to read that book. I'm definitely buying it now I've read your post. Thanks so much for the wonderful comments. I'm so glad you liked the story. The second in the series, "Do You Believe In Magic," Clay's story, will be coming out in October 2007 from Medallion. They've also indicated they want the third, Gloriana's story, "Your Magic Or Mine?"